A mild and cloudy day which made for ideal walking weather. No sweating and no freezing! The plan was to walk the towpath and get an idea of the availability of moorings further towards London. I also wanted to check the CRT water point at Black Horse Bridge. 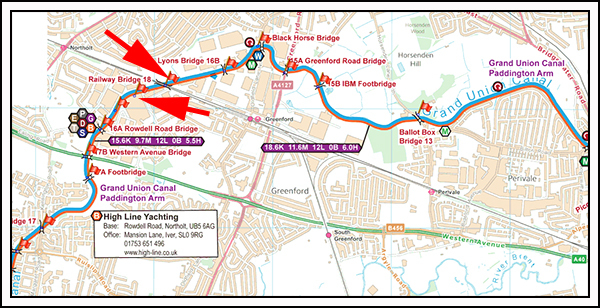 Paul Balmer (nb Waterway Routes) had sent me an email asking if I could check the map information on two of the bridges which were on today’s route. 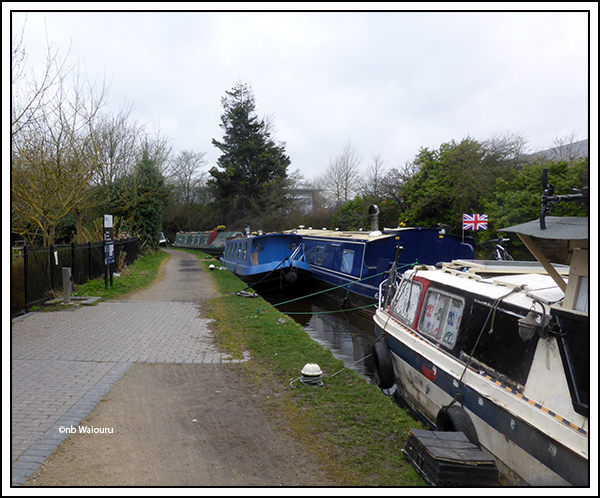 The walk took me from Willowtree Park to the CRT 7 Day Moorings just short of Alperton. The walk can be seen on the following map. Paul, I can confirm my gps shows all the bridges on your map as accurate. 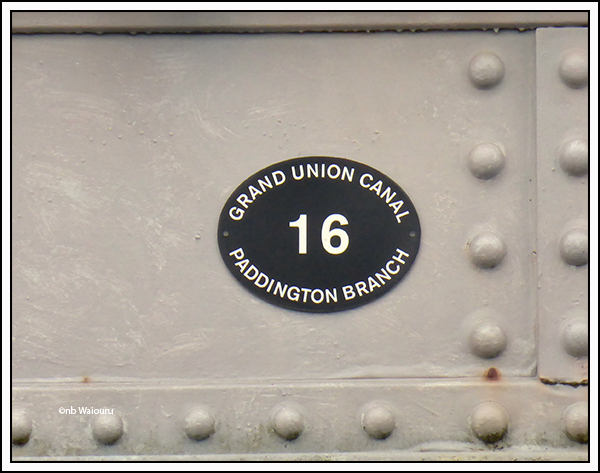 You also asked about the plaque on Bridge 18, a railway bridge. You were right….. It isn’t Bridge 18. No, I don’t know why Bridge 16 is located between 16A and 16B! 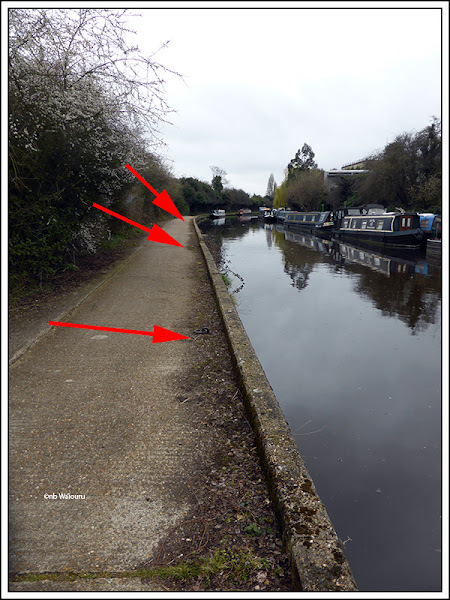 I happened to notice there were two locations with mooring rings on the towpath side. Their location is shown by the red arrows on the map above. Photos of both locations below. Both locations appear to be former wharfs. There are probably better locations to moor in this area but pins would be required. I reached the water point at Black Horse Bridge to find three boats on the water point mooring. None of them had anyone aboard. This is the second water point we’ve seen in the London area where boaters appear to feel there’s nothing wrong with mooring on facilities. Tap on the left with a narrowboat and wide beam occupying the western end of the mooring and a tupperware boat on the eastern end. There were 14 day moorings here and they were full. About half of the boats were displaying winter mooring permits. 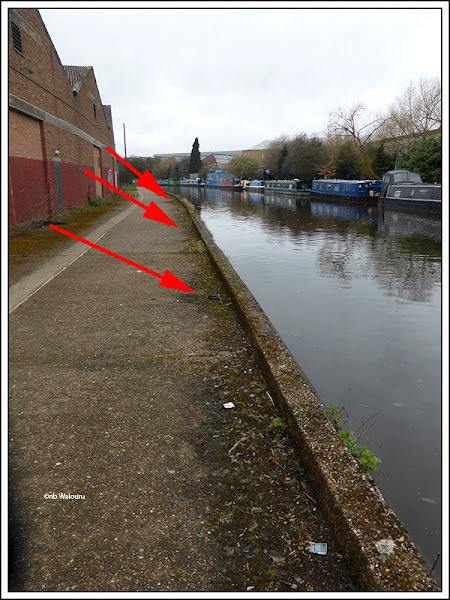 I walked further on the the 7 Day moorings at Alperton to find one lone moored boat. Why only one boat here when the Black Horse moorings were overflowing. Of course; Black Horse has the water point, pub and a railways station! Retracing my route I reached Black Horse moorings to find a very long water hose running from the adjacent pub to one of the moored boats. There was a boater on the roof of the wide beam moored on the water point so I asked him if the CRT water tap was working He told me he didn’t know. <Deduction> He wasn’t moored on the water point to get water. I checked the tap and it wasn’t working. Obviously this is why the moored boaters have combined their hoses to get water from a tap at the pub. We will have to re-think our plans for refilling the water tank. On the way back to Waiouru I noticed a tower off to the south. It’s a very similar style to the carillion in Wellington, NZ. I can’t find it on Google Earth so perhaps it’s a recent structure? Thanks for checking the number for the railway bridge. It was the position of Taylor Woodrow Footbridge 19AD that I was particularly interested in, which is just off the screen shot so I can't see if you checked that one. 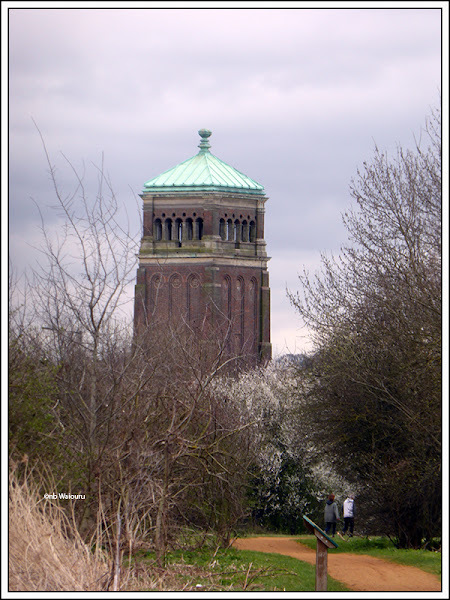 The tower is part of the former Aladdin paraffin lamp and heater factory located on the A40 trunk road. Yes I checked it and The locatio was correct. My error in not allowing for the photo frame cropping! Re the tower that is " ... very similar style to the carillion in Wellington, NZ.". My judgement is that it is an old water tower, built to give storage and pressure to the locality. I erred in my judgement (!!). It's apparently know as 'The Aladdin Tower', as it was part of the factory that made Aladdin paraffin heaters (although I suppose it could have been 'their' water tower). For Google Maps, this shows the canal (top right) zoom in to see Dunhelm Mill named, and the green square for the tower. Good information David. It confirms much of what I've already found and included in today's blog post which will be published this evening. Since making my request for you to check the location of Taylor Woodrow Bridge 19AD I had heard from other sources that the bridge has been removed, although you seem to have found it. CRT list a stoppage for its replacement at https://canalrivertrust.org.uk/notice/2525/taylor-woodrow-footbridge-bridge-19ad-paddington-arm which I assumed was to put it back. Perhaps that is to remove an old one and provide a new one in just one stoppage. We were moored on the off-side by Bridge 19AC. 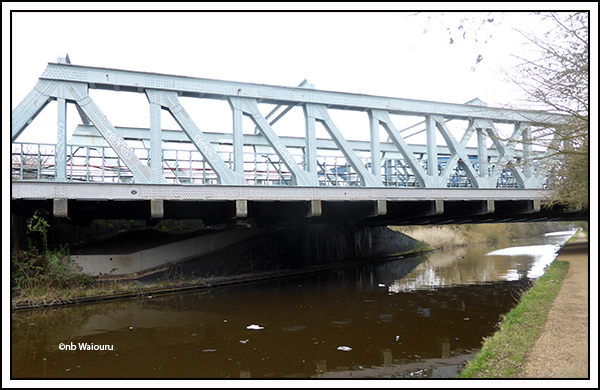 I walked to the 7 Day moorings before Alperton and recorded the positions of all the bridges as far as Bridge 13. Your map is accurate as to the quantity and location of the bridges. The only error was the number of bridge 16 (not 18). !9AD was definitely there and was the first I recorded.